This site introduces and promotes GREAT DEAL TRAVEL SERVICES. Please feel free to browse our site, should you have any comment or inquiry, please contact us or you may CLICK HERE to send us an email. BUILD A CAREER IN THE TRAVEL INDUSTRY!!! 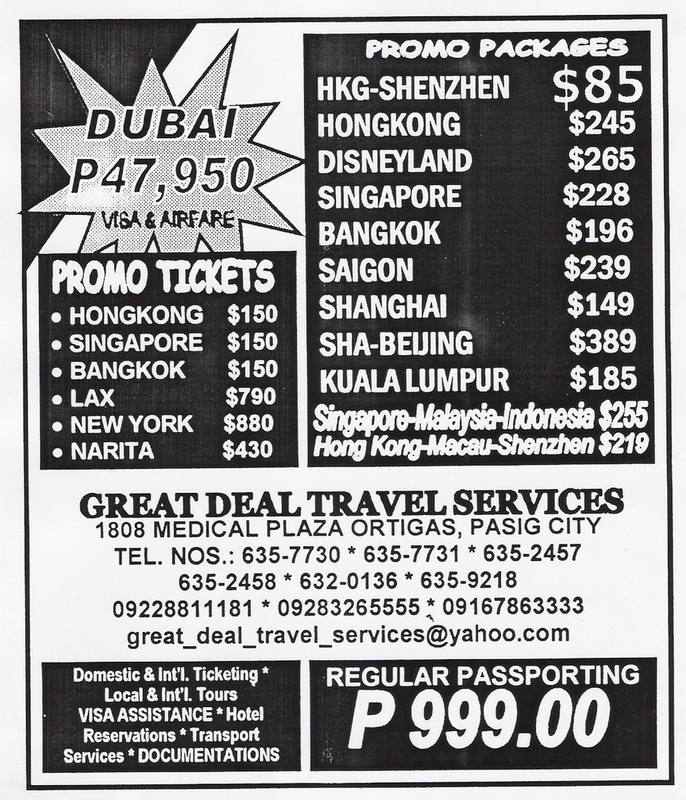 Attend the SALES CAREER IN THE TRAVEL INDUSTRY SEMINAR to be held on March 10, 2007 (Saturday) at Richmonde Hotel. Seminar Fee is Php 2,500.00 only! Register on or before February 20, 2007 and avail our EARLY BIRD RATE of Php 1,995.00 only! Come and see DUBAI! The City of Gold offers a wide array of business and pleasure. 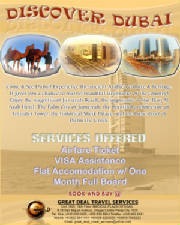 Experience the ancient arabic culture and heritage...It gives you a chance to marvel beautiful landmarks of the country! Enjoy the magnificent Jumarah Beach, the impressive 7 Star Burj AL Arab Hotel, The Palm City of Jumeirah, the beautiful architecture of Emirates Tower, the historical Sheik Palace and the busy street of Dubai the Creek.Feel relaxed on a camel ride and spend a night under the dessert moon while watching belly dancing performance...Feast your eyes on a wide range of precious glitters and shop til you drop. Explore the opportunity of destinations perfectly combining business exploration, carrer move option and dessrt adventure that are uniquely Dubai.